Today, Finnish mobile phone maker Nokia announced a new mobile application for its Windows Phone-based Lumia handsets, namely Nokia Conference. 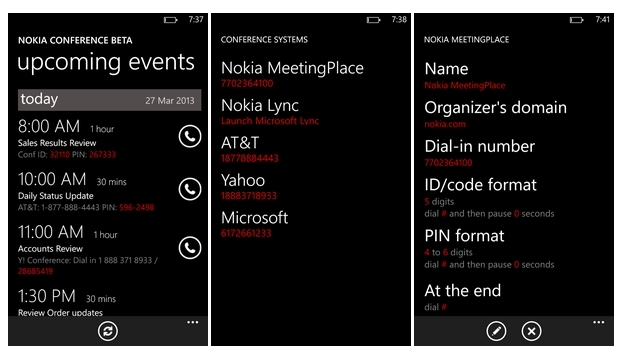 Users interested in joining a conference can do so easily via voice commands. All they need to do is to hold down the Windows key and then speak the “conference join” command. “We'll automatically figure out which meeting is going on currently or about to start, say it back to you for confirmation, and connect you. If your company uses Lync, we'll launch the Lync app to connect you. Windows Phone 7 users get the rest of the features, just no voice joining,” Nokia explains. Furthermore, the team of developers behind the application notes that there might still be a series of issues with the app, and that users should provide feedback on their experience with the software, so that enhancements could be made. “If you find any meeting where Nokia Conference doesn't parse the ID / PIN info correctly, or have trouble getting a company's conference system(s) to work, please let us know,” the company continues. “Open the meeting in the app and pick ‘send feedback’ off the menu to easily email us the meeting details. For an app like this, we need your help to make sure it covers the variety of conference systems out there,” said blog post explains. Additional info on how the new Nokia Conference application works can be found on this page on the Nokia Beta Labs website.